Americans have greater than $800 billion in outstanding credit card debt, according to data from the New York Federal Reserve. What’s more, roughly 8% of credit card debt is delinquent by 90 days or more. If you’re someone saddled by debt and trying to avoid those lofty interest rates by paying it off, moving somewhere affordable with high-paying jobs is a great strategy. That allows you to accumulate money in your savings account so you can easily pay off any charges you rack up. Below, we rank the best places to get out of debt. In order to rank the best places to pay down debt, we examined data for 524 cities and then whittled the list down to 67 cities that fit our size criteria. We then compared those cities across the following metrics: high school-graduate income, taxes, cost of rent and expected monthly credit card debt payment. Check out our data and methodology below to see where we got our data and how we put it together to create our final rankings. Washington offers hope for debtors Washington State has two cities in the top 10, including the No. 1 city, Tacoma. The high incomes available to Washington high school graduates is the primary reason this is a good state to pay down debt. Expensive cities likely are not worth it If you are looking to pay off your debt and are attracted by the relatively high incomes on offer in high-cost-of-living areas, the trade-off is likely not worth it. In the bottom-ranked cities, we see California cities like Fremont and San Jose, where high school graduate incomes are high but not high enough to make up for the high taxes and high rents. Tacoma is the best place to pay off credit card debt, according to our analysis. Using our model, we estimate someone could pay off $5,700 in credit card debt in about seven months. The main reason Tacoma ranks well is the high pay high school grads can earn. The average high school graduate here earns $34,286 per year and is left with about $20,800 after paying taxes and rent. Bakersfield comes in a close second. We estimate that someone aggressively paying down credit card debt could do it in about 7.4 months here. High school graduates in the area earn just under $34,000 per year, a relatively high amount that enables them to pay off debt faster. In those short seven months, someone paying down $5,700 would still have accrued $357 in interest payments. The most affordable rental unit you can reasonably acquire in Fort Worth costs slightly more than $8,000 per year, or about $670 per month. To cover that, taxes and your credit card bills, you will need to manage on $32,073 per year, what the average high school graduate makes. With careful planning, our model says you would end up with about $19,373 in disposable income, with which you could pay off credit card debt in 7.5 months. Rent and taxes are relatively expensive in Chandler. But counterbalancing the relatively high cost of living are the high incomes for high school graduates. The average high school graduate here earns nearly $36,000 per year, and we estimate he or she could pay off credit card debt in 7.7 months. Gilbert, another Arizona city, is slightly worse for paying off credit card debt compared to its neighbor above, according to our analysis. The average high school graduate here earns $36,500 per year and would owe nearly $6,200 in taxes. Add to that annual rent of $11,500, and we estimate a high school graduate here could expect to have about $18,600 in disposable income. With an aggressive approach to paying off debt, the average credit card debt holder could be debt-free in 7.8 months. This college town is a great place for people to pay down their debt. A local high school graduate, for example, earns just under $30,000 per year but, thanks to low costs of living, could manage to have $18,500 in disposable income. On that income, a person could pay off $5,700 in credit card debt in just under 7.9 months, according to our calculations. 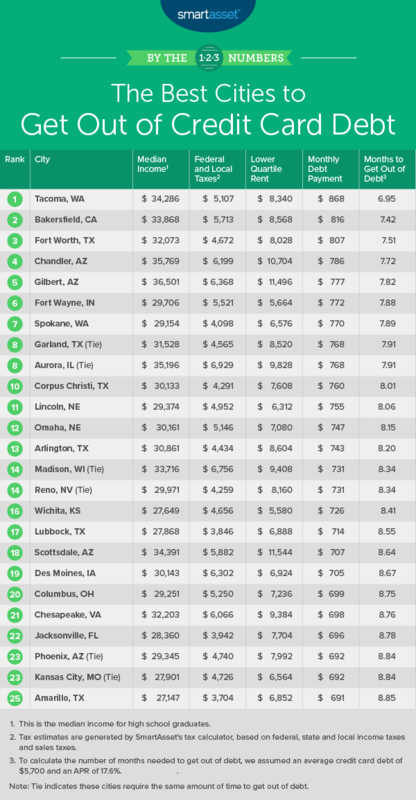 In Spokane, Washington State’s second city in this top 10, you can find affordable rent at a cost of about $6,600 per year. Add to that taxes of just under $4,100 per year, and the average high school graduate should have about $18,500 in disposable income. Assuming half of that is dedicated to paying off $5,700 in credit card debt, we estimate you could be debt free here in 7.89 months. Another Texas town is a great place to pay off credit card debt. Assuming credit card debt of $5,700, a high school graduate earning the average amount could pay down his or her debt in 7.91 months. Even paying it off that fast would mean paying nearly $400 extra in interest payments, showing how expensive credit card debt can be. Aurora has a fairly high cost of living offset by relatively high incomes for high school graduates. We estimate it would take 7.91 months for the average high school graduate living in an affordable rental to pay off the average amount of credit card debt. 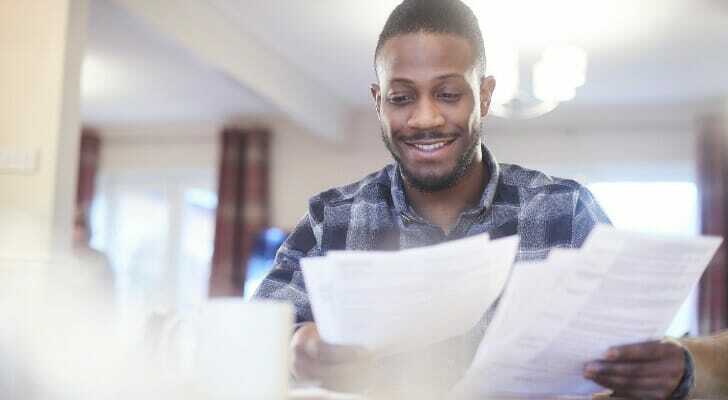 The good news is once a person has paid off his or her credit card, the new budgeting skills the person has developed can help him or her build some savings. Our list rounds out in Corpus Christi, Texas, where slightly more than eight months of aggressive saving and spending would be enough to pay down the average amount of credit card debt. One reason why Corpus Christi is a good place to pay down debt: Texas does not have a state income tax. That means more income residents can save and use to pay down credit card debt. In order to find the best places to pay off credit card debt, we created a credit card debt payment model for 67 cities. To determine our list of cities, we excluded cities with a population below 200,000 and those with a below-average unemployment rate. To complete the analysis, we first calculated the amount of disposable income a high school graduate could have in each city, assuming he or she earned the median salary for high school graduates with no further education. Using SmartAsset’s income tax calculator, we found the after-tax income for local high school graduates. We then subtracted the annual lower-quartile rent to find how much disposable income the average high school graduate would have. Lower-quartile rent is the lowest number under which 25% of renters pay for rent. We then assumed that high school graduates would dedicate half of their disposable income to credit card payments. Using that figure, we calculated how long it would take to pay off $5,700 of credit card debt, which was the average amount held in the fourth quarter of 2017, according to a ValuePenguin report. We also assumed consumers would be paying interest of 17.6%, which was the average credit card interest rate, according to Bankrate analysis. Data for population, median income for high school graduates and lower-quartile rent comes from the U.S. Census Bureau’s 2017 1-year American Community Survey. Unemployment figures come from the 2017 5-year American Community Survey. Build an emergency fund It’s always a good idea to have a pot of money you can rely on in case emergencies arise. Typically, this is called an emergency fund. Without an emergency fund, you may have to rely on expensive credit card debt to make ends meet when your car breaks down or you need to cover surprise medical costs. Get professional help A financial advisor may make sense for those who find themselves habitually turning to credit cards to cover their costs. A financial advisor can help you create a budget and invest your money wisely so that you don’t find yourself buying anything you can’t afford with your credit card. If you are not sure where to find a financial advisor, check out SmartAsset’s financial advisor matching tool. It will match you with up to three local financial advisors who fit your needs. 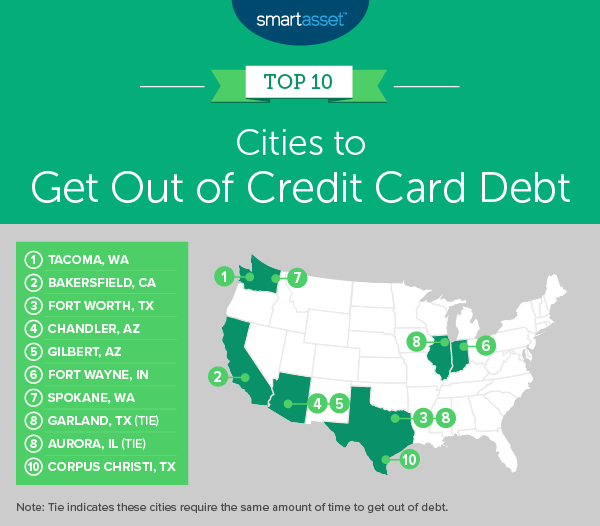 The post Best Cities to Get Out of Debt 2019 Edition appeared first on SmartAsset Blog.